Aidan Baker’s discography is running over 100 pieces with his solo work, his duo Nadja and thousands of other projects. Together with Jakob Thiesen and Neil Weirnik he’s doing slightly different things with Whisper Room. As always repetition is a constant factor in this project however the direction is far more rock orientated; space rock and post rock to be more specific. 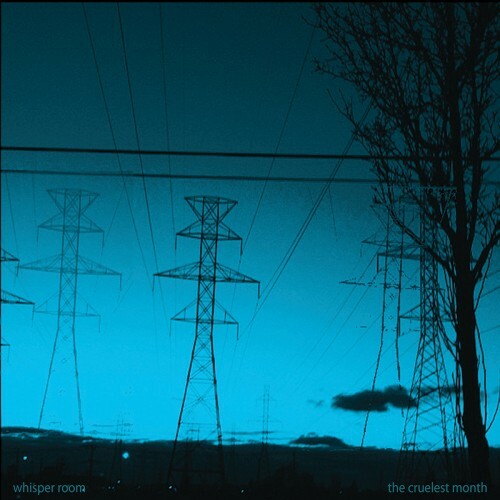 Their first album Birch White was released in 2009 and now, five years later Consouling Records is surprising us with the second album The Cruelest Month. The six untitled songs are open and spacy and fill the ether smoothly. It’s almost lounge music to recover from your hangover the day before. The sweet drum patterns are altering your brain cells in a different state; the spacy guitar sounds & laptop effects will do the rest. Ambient reverbs surround the Krautrockish base structure and this dream continues in the first three songs. In the fourth song the drums quit for a minute and slowly a guitar rhythm is popping up with percussion being remixed so it has a feel if it’s recorded in an empty factory. The guitar melodies and reverb are slowly increasing in volume until we are in song five where the drums are building up towards a climax and the guitars sound serene with a laptop sample of the rolling sea in the back. The climax never comes through, which is not a problem at all. With this ambient space rock the only thing that matters is the open chilling atmosphere. In the last song the engine is restarted once again with subtle samples, percussion and guitar loops to finish the trip in three quarters. The end phase is turning into industrial percussion, noisy guitar freakery and chaotic samples and then it stops. The experimental trio does what it has to do, to distract their listener and end the dream. They exactly did and for sure not everyone will like that. That’s what you get with the Cruelest Month.